Proceeds support the IUP Folkmen Scholarship. The decade of the Sixties was a time of great change. 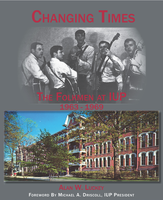 This is the story of that decade, as experience by The Folkmen, an award winning folksinging group at Indiana University of Pennsylvania. It is a personal history of how they saw, and reacted to, the shifts in American life. On a national level, the young people of the Sixties saw the beginning of the space age and the cold war at its peak, living with the fear of a nuclear holocaust. The loved the election of the dynamic John F Kennedy to the presidency, and felt his assassination rock the country. College students lived the sexual revolution and became involved in the fight for civil rights. The Vietnam War was the pivot that changed American politics and charged youth to rebel in ways that their parents never dreamed. In the midst of these turbulent times, Indiana State College became a university and grew exponentially, and The Folkmen, performing the new and vibrant folk music of the Sixties, sang their way through Pennsylvania, Ohio, and New Jersey. Their story, the personal touch of this watershed decade, is a retrospective look at the fascinating Sixties. At just forty-one years old, Dr. Autumn Klein, a neurologist specializing in seizure disorders in pregnant women, had already been named chief of women's neurology at Pittsburgh's largest health system. More than just successful in her field, Dr. Klein was beloved--by her patients, colleagues, family, and friends. She collapsed suddenly on April 17, 2013, writhing in agony on her kitchen floor, and died three days later. The police said her husband, Dr. Robert Ferrante, twenty-three years Klein's senior, killed her through cyanide poisoning. Though Ferrante left a clear trail of circumstantial evidence, Klein's death from cyanide might have been overlooked if not for the investigators who were able to use Ferrante's computer, statements from the staff at his lab, and his own seemingly odd actions at the hospital during his wife's treatment to piece together what appeared to be a long-term plan to end his wife's life. In Death by Cyanide, Paula Reed Ward, reporter for the Pittsburgh Post-Gazette, describes the murder investigation and the trial in this sensational case, taking us from the poisoning and the medical staff's heroic measures to save Klein's life to the investigation of Ferrante and the emotion and drama inside the courtroom. Are you new to an organization and want to learn the "soft skills" needed to succeed? Are you concerned that your style doesn't fit with the teammates you've been assigned? Does your workplace drive you crazy? In "Don't Break the Rope!" psychologist and leadership trainer Dr. Erick Lauber uses the story of two frogs new to a business called GoodPondInc to explain several basic principles of organizational communication, collaboration, and teamwork. In these pages you'll discover: - How to identify your own and others workplace styles - How to respond when teammates behave in ways you consider "wrong" - Why many people become unproductive when relationships get "broken" - What experienced leaders want you to keep in mind above all else - How to manage workplace situations for greater enjoyment and success We all must navigate work relationships, but handling them well is not something we are taught in school. If you want to learn how to improve your workplace in a fun, easy to read fashion, this book is for you. Whether you re entering the college scene for the first time or returning after a not-so-successful initial attempt, First Semester Success can load you up with tips and strategies for achieving your academic goals. With an entry for each day of the semester (and some bonus tips, too), this book shows simple ways that students can take control of their own learning, studying, reading, habits, and goals. Make reading this book one of your new goals today, and commit to testing the ideas in this book over the semester. You might be surprised at your first semester s success. Lawrence K. Pettit has had a dual career in politics and academia. After teaching political science at both Penn State University and Montana State University, he spent over twenty-five years as a university chancellor or president in Montana, Texas, Illinois, and Pennsylvania. His career also has included stints as legislative assistant to two U.S. Senators; Washington representative for higher education; campaign manager, head of transition, and staff to a Governor; and running for Congress. He writes knowledgeably about the sometimes contentious interplay between politics and the public university, and about the psychological, political, and career consequences for leaders who straddle that divide between often warring camps. In If You Live by the Sword, the author speaks honestly about the human struggles of the university presidency, and how that seldom discussed aspect of the role is intensified by the intrusion of partisan politics. In order to distinguish this from the usual such memoir, Pettit takes the reader behind the scenes. He shares highlights of his own political and intellectual development and discusses how his formative years and his time as a university leader were affected by the evolving political history of the country from 1937 to 2003. Leonard Hall Tablatures Print, 12" x 12"
Leonard Hall Tablatures Print, 17" x 17"
Paintings in this richly colorful, hard-cover book are featured in a permanent installation of 80 works, Homage to Indiana County in the Performing Arts Center at IUP. 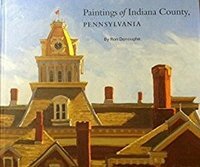 Scenes on the IUP Campus and throughout Indiana County were painted on site by award winning plein air artist and IUP alumnus Ron Donoughe. Proceeds support the University Museum at IUP. How can educators and other professionals caring for children extend the learning potential of read alouds? This book is designed to help teachers, special education specialists, and speech-language pathologists achieve two objectives: 1) how to interact with children around books in ways that are instructive in nature but also responsive to children's verbal contributions; and 2) how to use literature, informational texts, and poetry to achieve the goals of the Common Core State Standards. The authors provide specific recommendations for structuring read aloud routines in the early childhood classroom, making the read aloud interactive, using instructional strategies that enhance children's vocabulary and content knowledge, and supporting and extending children's verbal contributions through scaffolding during the activity. This practitioner‐friendly text also includes methods for supporting children with special needs, as well as English language learners. Recommendations for how to choose quality books in each of the three genres-- informational, literature, and poetry. The most useful interactive‐instructional strategies. The types of visual supports and props that can augment the read aloud. Methods for extended learning opportunities. Examples and excerpts from actual read alouds to illustrate the methods. Read aloud activities that align with the Common Core State Standards. Recounts the story of the challenges, hardships and successes spanning the early decades of the 1900's. Water Bookends, a story of tragedy and friendship, tells the incredible account of young Carson Mathews. In a dreadfully short time span, Carson and his family are blasted with two novel tragedies that often leave others a shell of their former selves. However, two young men in Carson’s life emerge and put the saying “blood is thicker than water” to shame. While holding young Carson up, these two remarkable friends repair his broken heart, keep the darkness at bay, and show Carson the best summer of his life – in what should have easily been his worst.